Valentines Week is coming up. This is the week to give and receive extra love. It might be from your spouse, or your grandchild, or your BFF. Whoever it is, be sure and celebrate. The first quilt this week is my most recent creation. I saw it on the internet from Temecula Quilt Co. and thought it was just too cute not to make. It measures only 7.5” x 9.5” and I even hand quilted it which is a little stretch for me. It went together so quickly I couldn’t resist. Doesn’t it just ooze Heartfelt Love? The next inspiration was made over 10 years ago, and it was from a pattern in Australia Patchwork & Quilting magazine. 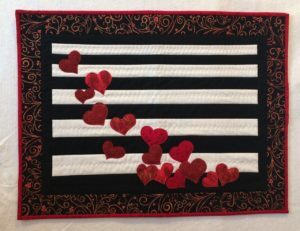 I just love the combination of 9 patch and appliqued hearts. Then using the piano key border with all the fabrics joined seemed to set it off nicely. I even found two wooden star buttons to apply on the bottom corners. Originally, I made it and gave it to my mom, but it has since returned home – lucky me. 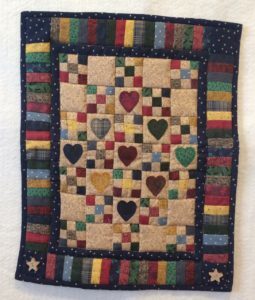 This last quilt was my original design called “My Heart Has Fallen for You” and I made it for my son. He had been widowed at age 30 (his wife died from skin cancer) and after a few years we thought he was going to get remarried so I started this quilt. Unfortunately, it didn’t work out and he is still single but I kept the quilt hoping there might be someone else in his life someday. Sometimes it is difficult to be alone. But it is also nice to have memories. Please enjoy your special people or your special memories this week. Happy Valentine’s Day to each of you. 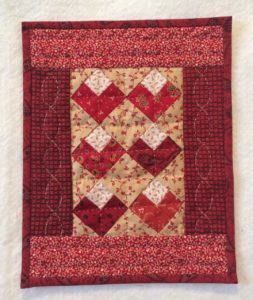 Just for You – Quilt Quote: “Quilting is like love. Enter it with abandon or not at all”.